I love Los Angeles. I love the beach, I love the sun, I love mountains, I love the people, and I absolutely love the food. I spent a few days in Los Angeles this past April to see friends and former students, and arrived with an extensive food itinerary. Father’s Office, a gastropub on Montana Avenue in Santa Monica, was at the top of my list. Father’s Office is known for their wide selection of beer and the famous Office Burger named by Esquire Magazine as one of the best burgers in the world. The Office Burger is not overrated. With no Father’s Office in Washington DC, I attempted to satisfy my Office Burger craving by making my own version of the cheesy caramelized onion arugula burger. Although it will never compare to enjoying a micro-brew with the burger in beautiful California on a lazy Saturday afternoon, it tasted pretty darn good and brought back happy memories of my time in Los Angeles. Heat a skillet over medium-high heat. Fry the bacon until crisp, 5 to 6 minutes, then remove to paper towels to drain. Crumble 1 slice and set aside; reserve the rest of the bacon for another use. Measure 2 tablespoons of the bacon fat into a medium heavy skillet. Add the onions to the skillet and sprinkle with the sugar. Cook until the onions are golden brown, about 20 minutes. Halfway through, stir in the crumbled bacon. At the end of the 20 minutes, stir in the balsamic vinegar, ketchup, Worcestershire sauce, liquid smoke, salt and pepper. Cook for 2 more minutes. Set aside. Mix in the salt to the ground beef. Shape the meat into 4 (7-inch) oval patties, about three-fourths-inch thick. Melt 1 tablespoon of butter in a large cast-iron skillet, over medium-high heat. Fry the burgers, 2 at a time, for 3-4 minutes, then flip. 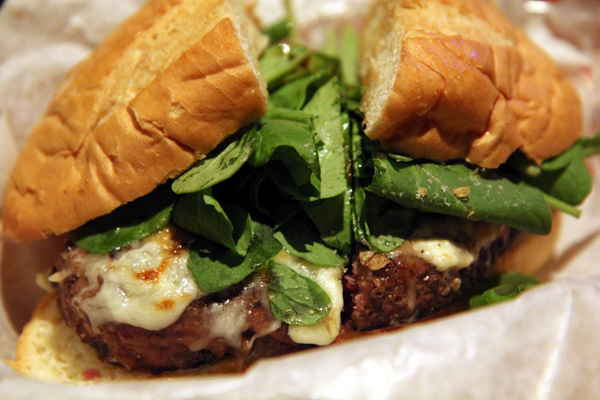 Top each burger with blue and Gruyere cheeses. Cook the burgers 3 more minutes for medium. Remove and keep warm; melt the remaining butter in the skillet and repeat with the remaining 2 patties and cheeses. 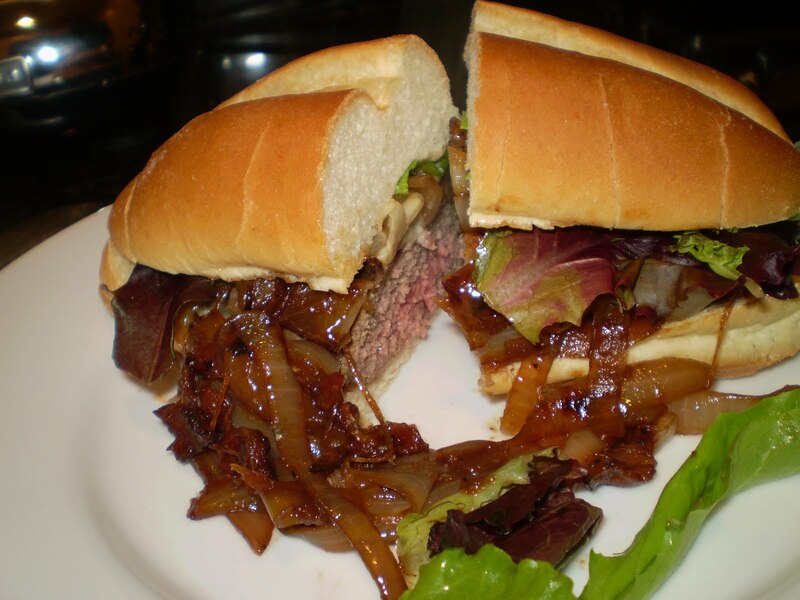 To assemble, place the burgers on the rolls and top with the onions and arugula, dividing evenly. ps. i thought i said adapted from burgerFLIES at first. ew! Father's burger? That sounds good.